We are all responsible for producing greenhouse gasses, so we should therefore all play our part in the reduction of them. Greenhouse gasses can be held accountable for Global warming – our worlds rising temperatures. The greatest greenhouse gas emission components are undoubtedly that of water vapor and carbon dioxide, from both the domestic and industrial sectors; particularly from coal-fired power stations all around the world. At present, the CO2 from the combustion of coal goes untreated, straight out the flue and into the atmosphere. Carbon sequestration could reduce greenhouse gasses dramatically, although we have the technology to capture CO2 at source. To date, however, we have yet to agree upon a long-term storage method. In the domestic area, there have been numerous government proposals to increase our energy efficiency in the home. This is a new series on the causes of climate change and how each and every one of us can play our part in reducing greenhouse gases and emissions. We begin by examining the gasses which cause the greenhouse effect then have a look at how we can reduce these. Greenhouse gasses are so named for their affect on warming the earth, which is slightly similar to that of a greenhouse, which traps the solar energy of the sun, heating the glasshouse. This occurs naturally in the water cycle and is the process by which the water evaporates from the rivers and oceans of the world. It forms clouds in the atmosphere and returns to earth as rain. 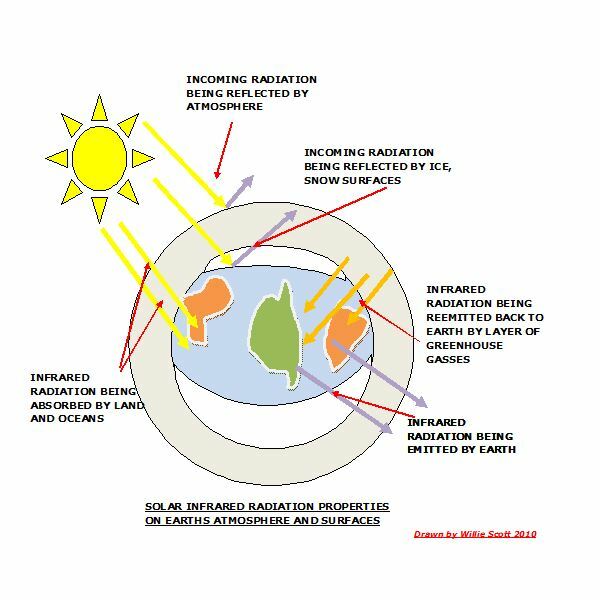 It is thought that clouds have a positive effect on the earth’s temperature shielding us from the suns thermal energy by reflecting incoming solar radiation. However, wherever steam is seen rising into our sky, such as from giant water cooling towers at power plants, we are producing anthropogenic water vapor. This gathers in our atmosphere due to the hydrogen element, and prevents some of the solar energy returning to deep space. Instead, it absorbs this thermal energy thus heating the atmosphere. Water vapor concentrations have not been well recorded, but it is thought to be one of the greatest constituents of greenhouse gasses. As we have seen carbon dioxide is another high emitter of greenhouse gasses. It was produced in great quantities during the western world’s Industrial Revolution, so we shouldn’t complain when the third world countries are doing exactly the same thing in their current Industrial Revolution. CO2 is emitted when a fossil fuel is combusted, gas being the least polluting followed by oil, with the biggest offender being coal. Unfortunately, the supply of hydrocarbons of gas and oil are due to peak in the next 15-20 years and run out sometime towards the end of this century. They have also become a very expensive form of producing energy, so many countries are turning to coal as a means of power, hence the increase of CO2 emissions. Methane is the most potent of all the greenhouse gasses. It is emitted from landfill sites; oil and gas production from refineries and coal mines. This gas is produced from the burning of fossil fuels, although to be fair, most of it is now removed by efficient fume treatment plants in power stations (albeit after Government Legislation). However, N2O is emitted by the agriculture industry and by the processing and application of fertilizers. Some types of waste incineration plants also still produce nitrous oxide emissions to the atmosphere. Most of us have heard how the Ozone Hole was discovered and led to the ban on the use of chlorofluorocarbons (CFCs), which at that time were used in refrigeration, insulation and aerosols. This was one of the three or four industrial gasses, including Perfluorocarbons (PFCs), Hydrofluorocarbons (HFCs), and Sulphur hexafluoride (SF6). These leaked into the atmosphere during some industrial processes. So, now that we have seen how greenhouse gasses are produced, we can further examine methods of reducing greenhouse gas emissions. The amount of water vapor emissions into the atmosphere is very difficult to quantify, as there are few records at present. The main culprits are power stations which use huge cooling towers to cool their circulating water, the evaporated water plume being visible for miles. In order to avoid this emission an alternative method of water cooling must be found, such as using seawater or water from saline aquifers in a closed circuit system, avoiding the release of condensation. Responsible for a worldwide accumulation of greenhouse gases, this is the one we should be aiming to reduce in the short term. I have written several articles on saving energy in the home, by using higher efficient components the use of condensing boilers in central heating, high efficient kitchen appliances, double glazing, and wall and loft thermal insulation. All these measures lead to a reduction in CO2 emissions from the domestic sector. Some of these measures can also be equally applied to business premises. Before we leave the public domain, let’s take a moment to think about our cars' efficiency. We all use cars as a means of transportation, however. there is no excuse for high emissions as modern cars are getting more efficient. Here in the UK, government incentives include road tax reductions for efficient vehicles having fuel consumption. There is also a scrapping allowance for scrapping an old inefficient gas- guzzler and rewarded by a cash payment which comes to the price of a new more efficient model. Cars are now being propelled by electricity and if we use renewable energy to produce electricity we are again reducing our greenhouse gas emissions. Industrial CO2 emissions are led by the use of fossil fuels produced by fossil fueled power plants. Mitigation of these emissions can be made by the use of Carbon Sequestration, where the CO2 is separated from the rest of the combustion gasses, liquefied and stored in a long-term safe location. We have the technology in place and just have to agree on the best location and optimal method of the storage of the CO2. Proposals include; the use of depleted oil reservoirs or coal mines, saline aquifers or in the world’s oceans. Renewable energy is currently saving a great amount of CO2 emissions and hopefully the percentage of energy produced by these devices will continue to increase. Energy extracted from the sea by wave energy devices along with those driven by underwater currents are becoming more popular as research and development continues. These machines can produce large capacities of electricity from most of our oceans. Onshore and offshore wind farms, solar energy, and biomass fired power plants are now being built regularly. Hydropower is still the world’s major supplier of electricity by renewable energy. Methane is produced in landfill sites, sewage works and cattle farms where it is sometimes freely emitted into the atmosphere. However, there are various schemes in progress to address these emissions. Methane from landfills is now being collected by a series of underground pipes and used to drive gas turbines which produce electricity. The gas from sewage works is produced by anaerobic digesters, also utilized to drive gas turbines and produce electrical power. Farmers are beginning to use the methane produced in animal manure to fire small scale boilers which produce heat for their farmsteads. Agriculture is the biggest producer of N2O emissions, mainly from the production and use of fertilizers. These emissions could be greatly reduced by applying natural fertilizers to the land and using nitrogen fixation plants such as clover. Both of these methods are currently being used in the cultivation of organic vegetables. These emissions are the result of gases leaking from the various industrial chemical and refining processes. Better maintenance of their equipment and pipelines would reduce these emissions. There are various methods we can use for reducing greenhouse gas emissions from our atmosphere. These emissions need to be addressed in the domestic, business and the various industrial sections. Power plants are where the biggest savings of water vapor and carbon dioxide emissions can be made and, as these two components of greenhouse gasses make up the largest majority of greenhouse gasses, their mitigation should be given priority throughout the world. Renewable energy is now being used worldwide as a source of heating and electricity production through devices which extract the energy from solar, wind and the oceans. If we commit to mitigating these two major greenhouse gasses, and if the encouraging increase in the use of renewable energy continues, these actions will certainly go a long way in reducing greenhouse gases and emissions. Here is a series of articles on the causes of climate change such as greenhouse gas emissions and global warming. Learn more about these factors and how reducing these effects can help to save our environment.